I’m glad you are having fun with it. The first couple of weeks I did one, I mostly got comments from people who I visited first. After a few weeks though, I started having people visit me first, which is really excited. I can see why wrap up posts would help people who are too busy to visit more than once in awhile. Thanks again! I like your wrap for the week. And the template is a great idea. Yes, I thought the template would make it less of a chore. 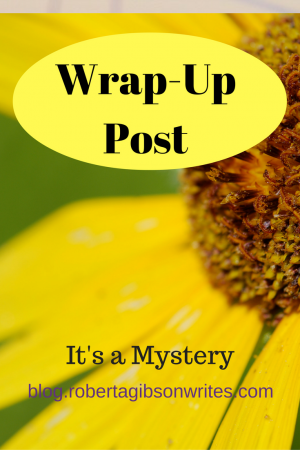 I usually do a weekly wrap up on the Sunday Post and they’re nice, although I don’t do the monthly ones that a lot of bloggers do. Bloggiesta looks like a lot of fun and one of these times I’ll participate. I’ll have to check out that Mocha Girls link since I’ve been reading more suspenseful stuff lately. I’ve thought about participating in bloggiesta before but just never have. Kudos for trying something new! Have a great week! Sandy, You should give the next Bloggiesta a try. It is a fun way to get out of a blogging rut and to meet new people.